Healthcare enterprises typically have bits and bytes of critical patient data that remain locked in databases and applications throughout the sprawling ecosystems of their extended healthcare network. What they typically do not have is the capability to connect disparate data or digitize their paper-based records to use as valuable information. This occurs because facets of their technology architecture are not tied together, and the healthcare networks or systems they belong to are incapable of transforming their business processes to bring the right information to bear at the point of service delivery. The data remains just that—data—and are not converted to intelligence (ie, a comprehensive collection of patient and provider data organized and presented in a way that enables clinicians and others to make accurate, effective decisions in a timely fashion). The lack of actionable patient and provider intelligence sets off a cascade of miscommunication among physicians, patients, clinicians, administrative staff, and other stakeholders. The result of such inefficiencies? Preventable medical errors and billions of dollars wasted on duplicate tests and unnecessary treatments. The lack of patient and provider intelligence not only hurts healthcare systems internally but also hinders their relationships with patients and business partners. It introduces unnecessary complexity to strategic initiatives such as clinical information sharing, provider management, claims processing, fraud reduction, tracking beneficiary identification, analyzing business contract information, and ensuring compliance with regulatory requirements. Increasing business intelligence in healthcare requires a foundation for true patient intelligence. This idea has moved to the forefront of IT priorities because of intense pressure from governments, employers, and patients to increase the quality and accountability of care services. Modern healthcare systems realize that they need a broader perspective; they need interoperable data to transform business processes and achieve patient and provider intelligence. A patient-centric health system starts by building an agnostic foundation to connect data between silos and make them interoperable. 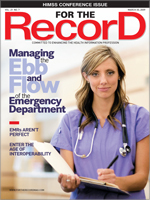 Interoperable health means sharing data from legacy systems, as well as newly deployed applications, to enable organizations to connect with new sources of healthcare data with minimal disruption. Patient and provider intelligence relies on the ability to locate and relate information across boundaries, whether they be departmental or geographical. A major driver of the interoperable movement is a concerted effort to reduce the number of lives lost due to preventable data errors and manage chronic disease populations—the root cause of a burgeoning healthcare crisis in countries where costs are growing at an unsustainable rate. Jane Smith arrives at an emergency department, where clinicians administer a medication to which she is allergic because they referred to the medical record of Jane E. Smith, a completely different person. Jane E. Smith’s insurance is billed for Jane Smith’s treatment, resulting in a refusal to pay. The healthcare facility’s initial claim submission is denied; resolving the error involves extra administrative costs. Jane loses confidence when the information she gave to the emergency department is not available at the imaging center and physician office, forcing her to repeat herself. This also decreases the staff’s efficiency and increases the risk of error. When Jane has duplicate records, her clinicians have inaccurate data, which may pose safety issues, causing Jane concern and costing the organization money to find and resolve. • tracking the loyalty of VIPs to ensure the organization is providing a seamless transition to these customers as both patients and donors. The data collected across healthcare systems continue to grow exponentially due to the increased use of clinical software, more complex regulatory reporting requirements, and the increased size of health systems as more facilities—and clinical business lines—are consolidated into single corporate entities. The stimulus bill signed by President Obama providing funds for electronic health records within healthcare reform will only add to the data intensification. To deal with this, the healthcare industry needs to enter an “Age of Interoperability.” Organizations that do not strategically plan to provide the level of data sharing required will find themselves at a disadvantage in the marketplace. The innovation in the HIT market in the past few years has provided healthcare systems with a wide array of choices for enterprise and niche applications. The foremost challenge for clinical and IT leaders is to optimize their future and past technology investments to ensure the patient information collected and stored in those systems can be used quickly and intelligently by all authorized stakeholders. — Lorraine Fernandes, RHIA, RHIT, is vice president and healthcare industry ambassador for Initiate Systems, a company enabling healthcare organizations to strategically leverage and share critical data assets.